I've always been a huge promoter of living a cash only lifestyle. But when I tell some people the best way to use money is to use only cash, they look at me like I have two heads! Fortunately though, using only cash, checks, and debit cards is becoming more fashionable these days. Of course, I don't do it because it's fashionable. I use a cash budget to fund my life because it just makes good sense! In this post I'll show you why it makes total sense to ditch credit and use cash. I'll also show you how to make the transition to a lifestyle that relies on cash flow instead of credit (it's not that hard, I promise!). Why Use Cash to Finance Your Life? I've written many times (including here and here) about the value of ditching credit in favor of cash-flowing your life using the money you have. Basically, any time you use credit cards, car payments, or other consumer debt, you're losing money on the deal. But when you use cash, it forces you to think more about the money you spend instead of mindlessly swiping a card. Think about it, using credit means you're paying interest and fees in return for using someone else's money to fund your life. That ends up costing you thousands of dollars every year that should be working for you instead of going to the bank. This is one of the big reasons why most of us are living paycheck to paycheck, living a lifestyle that exceeds our cash flow. What If You Don't Make a Lot of Money? My answer is when you have a small income, it's even more important that you use a cash only budget. When you have a limited income, every penny counts. The last thing you need is to waste money when you don't have to. Spending extra money on interest and fees puts you even further behind than someone who makes a higher income. Therefore, going cash only will have an even bigger impact on your bottom line! 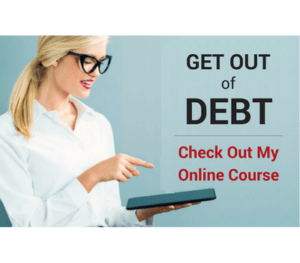 Yes, I know it's not easy to stay away from debt when you have a small income. But here's the deal, do you want to keep more of your hard earned money than you do now? Or would you rather give a portion of it away to the bank for the privilege of using their money instead? When it comes down to it, how much you make matters less than how efficiently you use it. 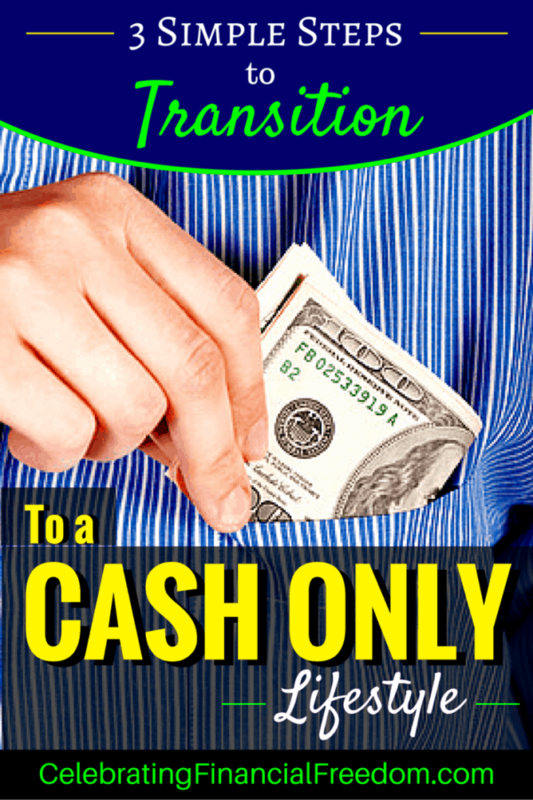 I often hear several common objections to using cash instead of credit. I'll answer three of the most common objections below. Swiping a credit card is easy. Cash takes more time and effort to deal with. On the surface those statements sound reasonable. But I'm gonna have to call BS on this one! Sure swiping a credit card is quick and easy, and cash takes a little more time to deal with at the point of sale. But overall, using cash, checks, and debit cards is no more of a hassle than using a credit card. With credit cards you still have to manage your statement every so often to make sure you're not overspending and you pay your bill on time. With cash you only have to deal with managing it once a month when you fill your envelopes (more about that below). After doing it for the last decade, I'll have to say I spend less time managing my cash than I ever did when I had credit cards! Cash is no more likely to get stolen than credit cards. Sure credit cards have a safety net that limits what you're liable for if your card gets stolen. But cash has a safety net too. If your cash gets stolen (which is unlikely) you can usually claim the theft on your homeowners or renters insurance. Unless you make it a habit to flash large amounts of cash when you're out in public, it's no more likely to be stolen than any other method of payment. How Will I Rent a Car, Get a Hotel, or Buy Airline Tickets? This is probably the most common objection I hear. There is a common misconception that you can't get a hotel, rent a car, or buy airline tickets with a debit card. I can tell you from personal experience that's totally false! I've been making these kinds of purchases with a debit card for over ten years with no problems whatsoever! The only difference is they might put a small hold on your debit card in case of damages. But that shouldn't be a problem because you'll have more money in your account since you're no longer feeding the credit card companies! There are only 3 simple steps to make the move to a cash only lifestyle. They are simple, yet powerful when you put them into practice! Unfortunately, most people think using cash to fund your life is kind of weird. If you want to succeed at anything in life, you have to do things differently than everyone else. People may look at you funny. Your friends might make fun of you. But when you never spend more than you make because you use cash only, you'll always be one up on those people (who are broke, by the way!). It does take a little time to get used to the transition from credit to using cash. But once you wrap your head around it, you'll wonder why you never thought to do it before! Once you commit to the process of using cash, it's absolutely essential to do a written budget every single month. When I use the term written budget, what I mean is a detailed budget that spends every dollar on paper before you spend it in the real world. Of course it doesn't necessarily have to be in writing or on paper. Using a spreadsheet or other electronic method works too, providing you account for every dollar you make inside your budget. Every dollar needs a place to go- Using cash means you have to know where your money is going. Whether it's savings, gas, car insurance, groceries, emergencies, or hair care, every dollar has to have a name. Spend every dollar in your budget before you spend it in the real world. It keeps you from spending more than you make- When you ditch credit and use cash, it forces you to use only the money you have to get by in life. You spend only what you earn instead of spending more than you make. A cash budget causes you to spend consciously- It's too easy to use credit without even thinking about it. You can run up a credit card bill much higher than you intended before you realize what you've done. Using cash from an envelope (more about that below) forces you to consider your purchase more carefully so you don't run out of money before you run out of month. 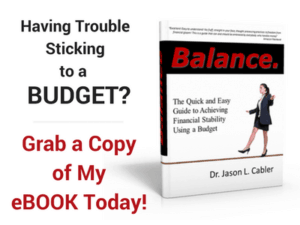 Here's my page with everything you need to know about starting and maintaining a solid budget. Once you do your budget and spend every dollar on paper, then it's time to distribute cash into envelopes. You don't have to have an envelope for every single category in your budget, just the ones you need money for on a regular basis. For instance, Angie and I pay all our monthly bills online directly from our bank account, so no need to have physical cash for those. Mostly, our cash envelopes are for things like groceries, restaurants, gas, school supplies, and other items we know we'll need to spend money on throughout the month. When you use the envelope system, you don't have to carry around large amounts of cash with you. Simply take what you need from your envelopes before you go shopping and leave the rest at home in a safe place. It takes a little time to get used to using cash in envelopes. But once you do, you'll truly understand why it's such a powerful tool to never spend more than you make! Click Here to learn everything you need to start your own envelope system. I've said it time and time again- if you want to succeed with money, you can't do what everybody else is doing. Going cash only is something that very few people do. But rest assured, those of us that do a written budget and use a cash envelope system have total control over our money. We never spend more than we make and credit card companies are a thing of the past! If I can do it, I know you can do it too. In fact, anybody can do this. It's not rocket science, it just takes a little discipline and the willingness to change habits. 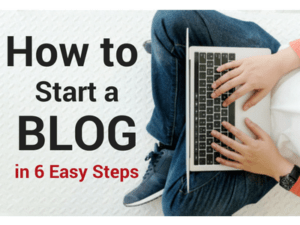 Go ahead and commit to completing the 3 simple steps I outlined above. Once you do, leave a comment below or on our Facebook Page and let me know how it's working out for you. I'd love to hear your success stories! Commit to being different is the quote that describes all of us in the personal finance community! I joke with my friends that I’m into all these crazy things and sometimes it’s hard to not have 100pct support for everything I’m doing or believe. Wouldn’t have it any other way though. Great post! I love my airline miles but have been swayed to get more into the cash only lifestyle for my budget. Different is usually better when it comes to a lot of things. I discovered a long time ago that being normal means being average, and I NEVER want to be average. Going cash only rocks!